In Alaska, they nest on St. George, St. Paul, and the Otter islands in the Pribilof Islands, and on Bogoslof and Buldir islands in the Aleutian Island chain. The St. George colony in Alaska contains over 80% of the world’s population. The second largest breeding colony is in Russia on the Commander Islands. They breed at only five to six locations in the world, all in the Bering Sea. The Alaskan breeding population is estimated at 209,000 birds and is classified as highly imperiled and a species of concern. Globally they are classified as a vulnerable species. Very little information is known about the species other than from breeding sites. The following actions are recommended to maintain the population: monitor food supply, determine wintering locations, reduce negative fishery interactions, implement buffer zones around colonies, and continue with rat prevention programs. Mostly white, but the upper surface of the wings and back are dark gray. Wings are tipped with black, the legs and feet are fire engine-red, and the bill is yellow. 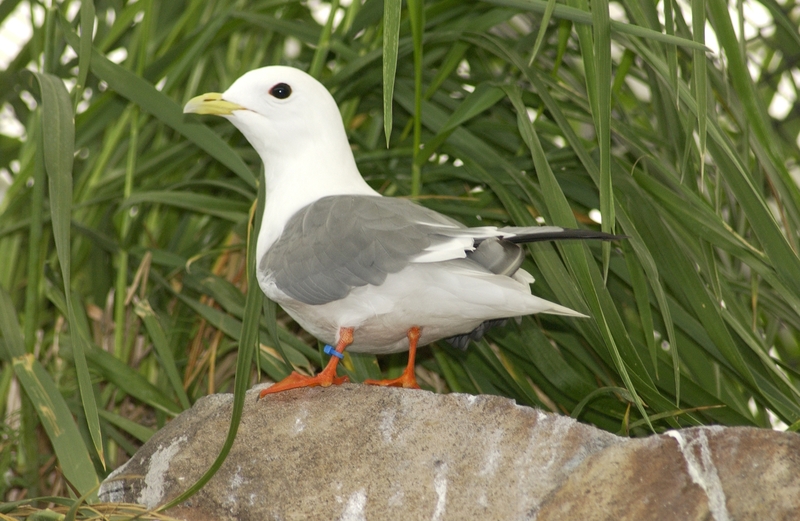 They nest on ledges of vertical sea cliffs up to 900 feet high with other species of seabirds, including their more common relative, the Blacklegged Kittiwake (Rissa tridactyla).